New for 2010, the Proform 10.0 ZE elliptical offers walkers and light joggers a lot of value for $600, including a Spacesaver foldaway design and iFit® Workout technology to help you lose weight in just 8 weeks. On the console, the blue tinted LCD window with Priority Display shows speed, time, distance, calories burned and pulse. The console also has a 5x7 matrix that displays your workout graphically. Adjustable Stride - 13" 15" 18"
UPDATE: The 10.0 ZE is no longer being sold. It has been replaced by the all new Smart Strider series. Check out the latest ProForm elliptical reviews here. The Proform 10.0 ZE comes with adjustable stride lengths of 13”, 15”, and 18” to help you target different muscles groups achieving better definition, or simply use the stride variation for a better fit for each member of the household. The elliptical trainer’s 8 weight loss workouts, plus the iFit® cards, and 12 levels of digital resistance further help you to adjust the workout for optimum benefits, and the handlebar sensors allow you to monitor your heart rate during exercise. There aren’t many elliptical reviews on this new machine but early buzz is very positive. The Proform 10.0 ZE has a solid ergonomic feel, oversized foot pedals, low noise, and decent adjustability. 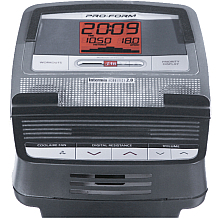 For users who need their tunes to stay motivated while pedaling, the console features a music port for iPod® that integrates with the Intermix Acoustics™ 2.0 sound system. The Proform 10 ZE also features a fold-up base so that you can easily store it out of the way, saving about three feet of floor space when not in use. 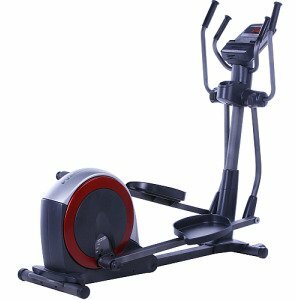 Proform dominates the entry-level elliptical market by offering machines that are heavy on value and features, and this new model lives up to that reputation. Although Proform’s short warranty is a weak point and the 275-lb user capacity is a stretch, the $599 Proform 10.0 ZE elliptical offers solid value for the price, and will be a good addition to your home gym. You get free shipping on all orders paid in full, or check out the financing option with payments as low as $18 per month.